The 26th of June was a proud day for Malaysia as the JEC Asia Composites show, held from 26-28 June in Singapore, honoured the country for its contribution to the composites market. Not only did the ex-Prime Minister of Malaysia, Tun Dr Mahathir Mohamad, receive a lifetime achievement award but so did CEO of CTRM (Composites Technology Research Malaysia), Datuk Rosdi Mahmud, who received a business achievement award. 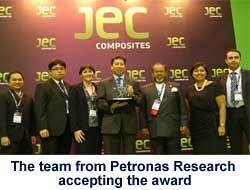 Meanwhile, DK Composites and Petronas Research received innovation awards for their composite innovations. 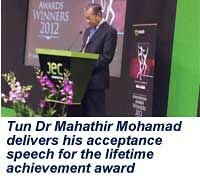 To receive the honour, Tun Dr Mahathir Mohamad marked the ceremony with his presence. JEC and the entire composites industry awarded him the award for his work during his entire career as he actively promoted the products, technologies and research and professional skills of the Malaysian composites industry. In his acceptance speech, the fourth Prime Minister of Malaysia said that 40 years ago, the composites industry only had glass fibre to contend with but today new materials that achieve better strength are being offered. �Even airplanes are using composites to replace parts that use aluminium,� he added, stating that this would achieve lightness in terms of weight and the use of fuel. Eleven companies from different parts of Asia were rewarded for their composite innovations and among them were the two Malaysian companies. Petronas Research was awarded in the offshore category for its PipeAssure technology solution that addresses the long-standing challenge of corrosion and other damage sustained by pipelines and containment vessels in the oil and gas industry. According to the research team that accepted the award, PipeAssure is a pre-impregnated system made from a glass fibre tape and a propriety epoxy resin system. It has been qualified to ISO/TC 24817 for corrosion protection as well as for repair and rehabilitation of damaged assets and infrastructure. Meanwhile, DK Composites�s glass reinforced composite panels for monorail trains bagged the award in the railway category. Designed for Mumbai Monorail and Kuala Lumpur Monorail, the team designed a ceiling, seat and apron; and a nose cab, respectively. It took the team two years to develop the product, which is a sandwich construct made from phenolic/glass prepeg � offering fire retardant properties while delivering the target weight � and PET foam. A vacuum-infused epoxy/glass laminate was used for the moulding process. The end-product complies with British Standard 6853 for fire, smoke and toxicity requirements. In a preceding paper presented by Mohd Yusoff Sulaiman, CEO of MIGHT (Malaysian Industry Government Group for High Technology), stated that Malaysia�s aerospace industry will contribute US$10 billion to the Malaysian economy while the railway sector will contribute up to US$50 billion to the industry. Sulaiman also said that currently Malaysia houses around 100 companies dedicated to the composites industry, with 30 involved in advanced composites and 70 in the industrial/consumer composites sectors. He also said that the growth in the rail sector will envisage the need for more composites in the metal replacement market and that MIGHT is working together with the country�s Construction Industry Development Board (CIDB) and DK Composites to promote and create guidelines for composites use. In the aerospace sector, Sulaiman said that Malaysia is an innovation centre. For instance in 2009, US-based supplier of commercial airplane assemblies/components to Boeing and Airbus, Spirit Aerosystems, set up a facility in Malaysia to manufacture A320 composite wing component subassemblies and undertake design work for leading edge lower panels for the new Airbus A350 XWB aircraft. Meanwhile, government-owned company CTRM has also been awarded a RM3.5 billion contract to supply composites aircraft components to Goodrich, a global supplier of systems and services to the aerospace and defence industries. The contract for the next five years is expected to be worth about RM450 million, while the two-decade period of the contract would be the lifespan of the aircraft. Set up in 1990, CTRM, which was tasked to develop the high technology based industry focusing on aerospace and composites, has grown to become a player within the global composites supply chain for major commercial and military airplanes makers worldwide, including Airbus UK, Spirit AeroSystems, EADS, CASA, GKN Aerospace and SONACA, besides Goodrich. CTRM as well as DK Composites are headquartered in the southern city of Malacca, which is being groomed as a composites technology centre by the country.